With this expansion, the basic rules can be changed in five different ways and combined as you wish. 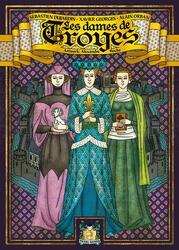 The Ladies of Troyes appear in the form of three new Character cards to be integrated into your games. A new action allows players to move their guards on the ramparts to access new activities outside the city. The head of each player's family is represented by a new purple die, which can take civil, military or religious actions, at the player's choice: others will not be able to buy this die. Finally, 27 new Activity cards and 6 Event cards appear to vary your games! Be careful this game is an extension of Troyes and cannot be played alone. To be able to play it you must have a copy of the game Troyes .